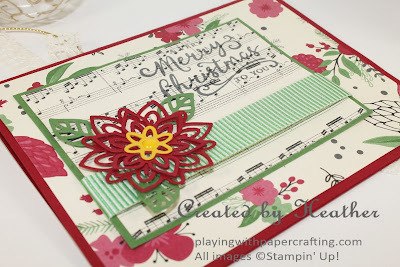 Playing with Papercrafting: Merry Christmas in July for Fab Friday and a Bonus for You! Merry Christmas in July for Fab Friday and a Bonus for You! This just so happens to be the main colours from our Christmas Designer Series Paper, This Christmas Specialty DSP, which I used on this card (with a wee pop of Crushed Curry for which I hope I'll be forgiven!). The two designs of This Christmas designer paper that you see here, the flowers and the music, just happen to be flip sides of each other and so are an efficient way of using a sheet of DSP (Designer Series Paper). 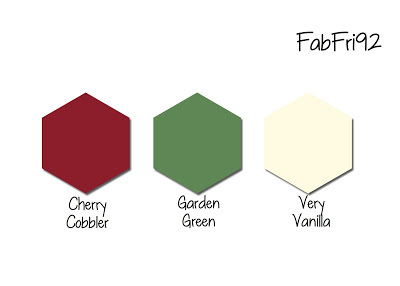 This is specialty paper because it has a weight and finish similar to newsprint, but a little heavier. The nice thing is that instead of only getting 2 sheets of each double-sided design you get 4 sheets. This is great for making multiples of the same card. The poinsettia is made from the die cut flowers from the Flourish Thinlit Dies. The three dies that make up the flower are perfect matches for the three sections of the largest flower: outer, middle and inner. By layering them and slightly curving the petals, you create depth and fullness. I used Crushed Curry for the Center layer because Poinsettia's often have those yellow stamens in the middle, which I believe are the actual flower, while the rest are really leaves. The leaf die was used for cutting 3 green leaves and then they were attached to the rest of the flowers using glue dots. Glue Dots attached the whole poinsettia to the upper panel. The ribbon is one of the new Mini Striped Ribbons in the 2015 - 2017 In Colours - Cucumber Crush used here. 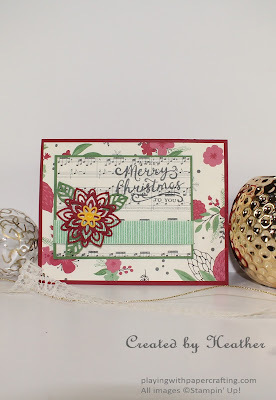 The sentiment is from the Reason For the Season stamp set. The Bonus for You is a card for which I will be offering a step by step photo tutorial for free in my August newsletter which comes out at the end of this week. It's a slider card made using the new Shooting Star stamp set and Sliding Star Framelits. You can make sure you get it by signing up for my email list by entering your email below. Don't worry, I won't flood your inbox with emails - just one or sometimes 2 a month. I am respectful of the privilege you have given me. 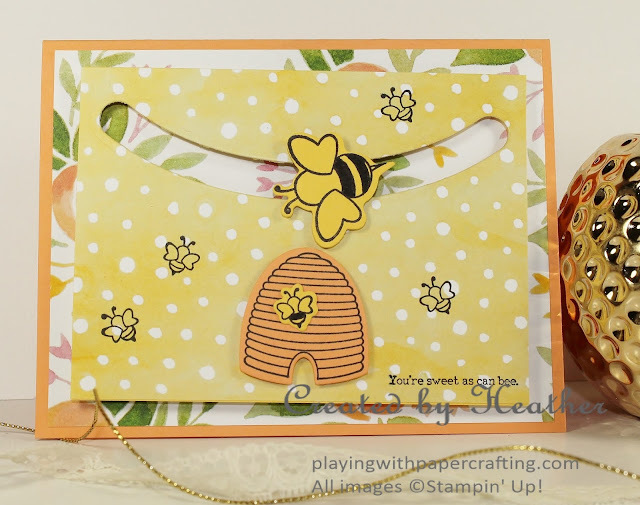 My newsletter will let you know whats new with Stampin' Up!, what's new with me and my classes, and each month will feature a new free photo tutorial and a stamping tip. If I send you another email that month, it will be because Stampin' Up! has brought out a new promotion that can't wait until the next newsletter to let you know about it, but never more than two. And here's where you can sign up to get your hands on that tutorial, which contains step-by-step instructions, including a list of materials and measurements.